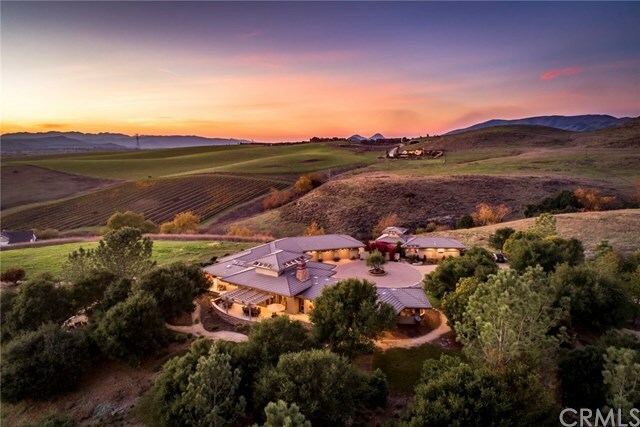 Commanding views of Edna Valley vineyards & rolling hills, this private single level gated estate & detached guest house on 1.4 ac offers sprawling vistas & stunning sunsets with the iconic 7 Sisters peaks as your backdrop. Enclosed within the coveted Edna Ranch gated community, enjoy the tranquility of rural wine country, while being just mins from the charming downtowns of SLO & Arroyo Grande. Frank Lloyd Wright-style architecture features walls of windows, glass doors & skylights creating bright, light-filled spaces. Custom built in 2001, main house offers 3 bed/3.5 bath single level home with great room, office & wine cellar, while detached single level guest house offers 1 bed/1 bath, living room & full kitchen. Main home greets you with a striking great room boasting 2-story ceilings, gas fireplace & panoramic views against a wall of glass doors. Expansive kitchen offers large center island, bar, luxury appliances & patio with outdoor kitchen & fire pit. Luxurious master suite enjoys panoramic views, patio French doors, 2 walk-in closets & master bath with jetted tub & walk-in shower. Grounds feature gated entry, grand driveway, solar, drought tolerant landscaping, multiple patios, gated orchard & 3-car garage. With the feeling of utmost privacy, this property is conveniently located mins from wineries, 8 mi to Downtown SLO & the Village of Arroyo Grande, 6 mi to the regional airport & 10 mi to Pismo Beach. Experience this wine country estate & guest house for yourself. Directions: Need gate code. Take Orcutt Rd to Edna Ranch Circle. Use the North gate entrance. Once inside, left on Via Piedra, and left into driveway.